Cecilia is a long time fan of Papa Louie’s many restaurants. 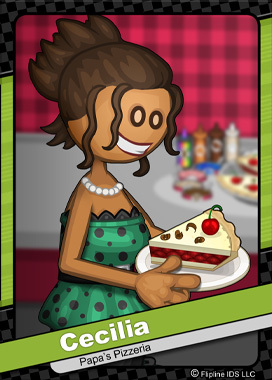 Most people around town recognize Cecilia as the girl who came in 3rd on the first season of Ballroom Bash. In the last few years since her disappointing loss, Cecilia has shied away from ballroom dancing. Her last spark of hope was a job opportunity at Whiskview Dance Studio, which fell through due to it’s unexpected closure. Cecilia quickly took a job at Papa’s Bakeria to pay the bills. Thankfully, after a year of hard work making pies, Papa Louie opened up Cecilia’s Dance Studio so she could pursue her dreams.